Wow, 20 years?! September 1, 2018, marked 20 years since the first Harry Potter book was published in the United States. Since then, the series has become an international phenomenon. According to Fortune, the series has been translated into 68 languages, and more than 400 million copies of Harry Potter titles have been sold worldwide. If you’re a Potterhead, you should most definitely plan a trip to London to visit these 8 locations from the Harry Potter movie series. In The Order of the Phoenix, Harry flies over Tower Bridge on his broomstick. I haven’t heard of anyone offering broomstick tours just yet, but there are plenty of outfits that operate tours on the Thames. Or you can take a DIY “tour” by catching a water taxi down the river! The Hogwarts Express departs from Platform 9¾ at King’s Cross Station, which is in the arched wall between platforms 4 and 5. So get your cameras out an take that obligatory Instagram photo! Who’s ready to go back home!? I know I for sure am! 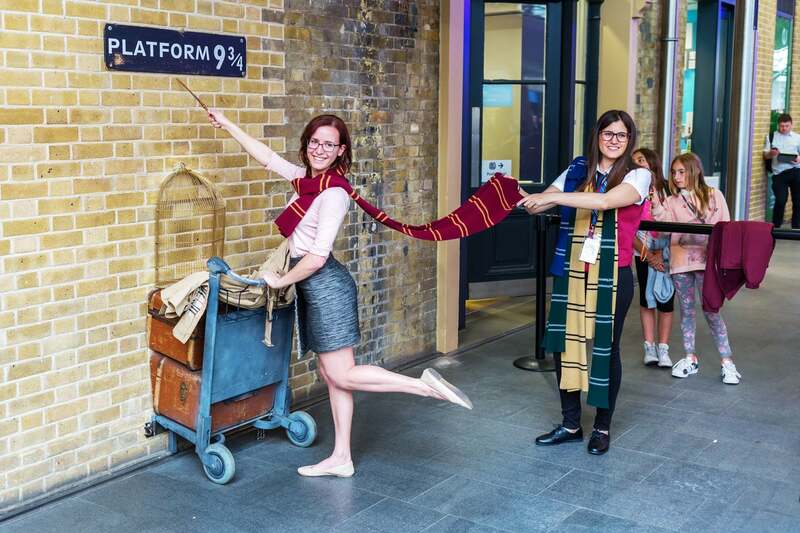 The wifi on the train has been amazing these past few years so I expect to see all those #backtohogwarts posts and outfits and essentials! Harry’s sorting happened in the Great Hall and was shot in this hall at Christ Church at Oxford University. In Harry Potter and the Philosopher’s Stone, Leadenhall Market was used as Diagon Alley. It’s a great spot to catch a quick bite while you’re out running around the city. Remember the scene where Harry, Hermione, and Ron have to jump out of the way to miss being hit a London bus in Harry Potter and the Deathly Hallows I? That scene was shot at Piccadilly Circus. In The Order of the Phoenix, Westminster Station was one of the main locations Harry uses to travel. A visit to London isn’t complete without at least one ride on the Tube, London’s underground metro. Weasley’s magical car takes off in Harry Potter and the Chamber of Secrets right outside St. Pancras International. It’s right next door to King’s Cross Station! Potterheads might recognize Millenium Bridge as the one that was destroyed by the Death Eaters in Half-Blood Prince. For Harry Potter fans a trip to Europe is a must-do. And luckily, you can easily make that dream a reality with miles & points! Especially with any of the best credit cards for travel. Here’s a quick and easy reference chart for flights to Europe using miles. And be sure to check out our post detailing the top 5 cheap (and simple!) ways to get to Europe using miles & points!